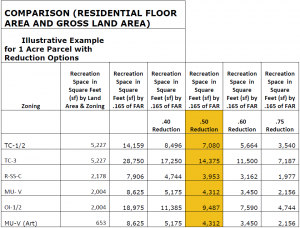 Parks Impact Fee: How Many (More) Goodies Do High Density Developers Need? I spoke before Council this evening on the proposed changes to Section 5.5 (Recreation) of the Town’s Land Use Management Ordinances (LUMO). The changes, which were discussed over a decade ago, approved by the NC Legislature July 10, 2008, essentially amount to an impact fee paid by developers to support parks and recreation. Unlike other development fees, the Planning Board, Parks Commission and Town staff worked to hammer out an assessment that roughly tracked the number of new users of parks and recreation services these new developments add to the overall system. Given that, you would think that a high density development adding 5 times as many folks as a R5 zone development would pay more. Crazily enough, that isn’t the case. If you develop a high impact, high density development you can look forward to paying 1/2 what other developers pay and, as a bonus, get the rest of Chapel Hill’s residents to underwrite new recreation services on your behalf. Inequitable – but then again Chapel Hill’s residents have taken on burdens – including subsidizing the West140 development at $10+ million in cash and $15-25+ million in property – for other recent projects. Since much of Town is built out and the number of low density residential opportunities shrink, the only strong near term revenue source will come from new high density developments. With a number of such new developments/redevelopments in the pipeline you would think staff and the advisory boards would urge Council to move fast – to strike while the iron is hot so to speak. The reality? A provision to delay while all these projects work themselves out of the pipeline. Just doesn’t seem fair to either Chapel Hill’s existing taxpayers or folks developing less dense options. The following chart illustrates the effect of the proposed change for high density residential projects. The first column shows the required Recreation Space for a residential development using the current system. 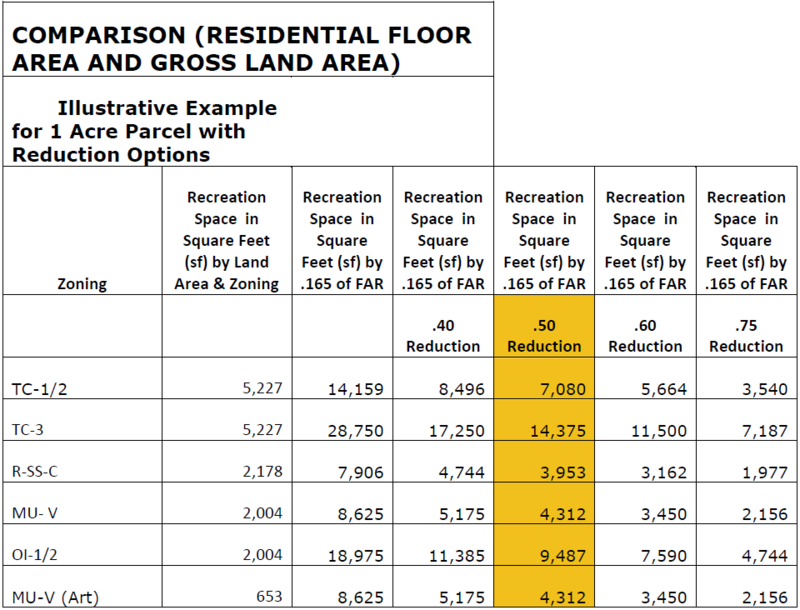 The second column shows the Recreation Space that would be required if the applicant develops the maximum allowable floor area under the proposed floor area based system, but without a reduction. The following columns show various reductions by percentage. The highlighted column is the recommended 50% reduction. A few of you might recall that I have asked Council to provide a family friendly park, pocket parks along with other amenities Downtown these last 6 years. With that in mind, I’ve been following and commenting on the evolution of the proposed ordinance since it was first suggested. While the overall framework looks solid, tonight I’d like to highlight a glaring problem with that ordinance. Higher density development Downtown has been promoted by calls for the need for more residents Downtown. More residents means more demand for high quality recreational opportunities. The higher cost of development also applies to creating suitable recreational opportunities for these folks within or near their high density residences Downtown and elsewhere. The proposed ratio of residential recreation space for TC1-3, RSSC, MUV and OI districts has been reduced – as the Parks Commission memo states – because “this provision may be necessary in order to encourage high density development in appropriate areas and to address the higher costs related to building high density development.” Note, no supporting material for that contention is given. 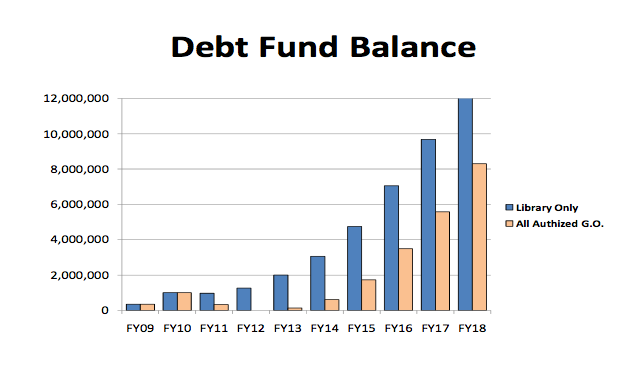 This ordinance has been in the pipeline since 2008 and the parameters for calculating much higher in lieu payments discussed since early this year. That hasn’t stopped proposals – like tonight’s Courtyard redevelopment project – from coming forward. The proposed %50 reduction in the required ratio means that the burden of providing these facilities is shifted off the shoulders of the developers who are profiting from this type development squarely onto the rest of us residents in Chapel Hill. As we’ve seen from the new crop of high density developments – East54 and Greenbridge, for instance – the community has invested significantly in infrastructure upgrades . These projects were granted substantial and beneficial variances above and beyond those allowed by the underlying zones. In one case a new zone – TC3 – was created to make the project work. In other words, we – the Chapel Hill community – have already supported this type of development with greater height limits, floor area ratios, reduced setbacks, reduced buffer, etc. At least Greenbridge stepped up and accepted, as a condition of their SUP, a required payment to support the Hargraves Center. Now the community is being asked to subsidize recreational opportunities for these high density developers who have already received the community’s largesse. What do we know then? We know that there has been no evidence provided that supports the contention that having high density developers pay their fair share will impede the submission or approval of these type projects. We know that reducing the required ratio will shift the cost of providing quality recreational opportunities onto the shoulders of the folks living outside these projects. This includes folks that have been waiting years, sometimes decades, for key unmet improvements they have already paid for with their taxes. With projects like the University Square redevelopment, Courtyard and Obeys Creek, we know that delaying the implementation of this ordinance means with there is a good chance the best opportunities for developers to share the cost of providing public recreational facilities for the residents of their projects and nearby neighborhoods will be missed. Please rethink the reductions in the high density requirements in light of the costs, the opportunities on the horizon and a common matter of fairness to the rest of Chapel Hill’s taxpaying public. Well Done Rogers Road Coalition! Some welcome news on the Rogers Road front. The Rogers-Eubank Neighborhood Association has been awarded a Federal EPA Environmental Justice grant to help address some of the long term environmental issues that neighborhood has faced as a consequence of taking on our trash disposal burden. The Rogers-Eubanks is an African-American, low-income community and has served as the host of the Orange County regional landfill since 1972. The community was promised basic amenities when the landfill site was originally purchased in 1972, however, amenities such as water and sewer service, storm drains, curbs and gutters, sidewalks, a recreation center and greenspace have not been forthcoming. The focus of PITCH is to achieve reductions of waste inputs to landfills and repair household energy and water inefficiencies. This will be achieved by reducing household solid waste, composting kitchen waste, recycling mixed paper, and using compost in a local community garden. In addition, the project will educate the residents on conserving water and energy through weatherization improvements, repairs of small-scale plumbing and sewage inefficiencies, and replacement of incandescent light bulbs with fluorescent ones. The project will engage Orange Country residents, the broader public, and news media on PITCH-In’s call to action for waste reduction and environmental stewardship. Now the ball is rolling, it is time to fulfill on some of the other promises made on our behalf nearly four decades ago. More information on the RENA home website. Can The Carolina North Process Apply To UNC’s Bingham Research Facility? Another issue on tonight’s Orange County Board of Commissioner’s (BOCC) agenda involved UNC’s Bingham Research Facility ( report on UNC’s response to environmental violations and plans for expanding the facility [PDF]). There’s been a number of recent (Chapel Hill News) stories (INDY) outlining the numerous environmental and policy missteps [PDF] made over the last few years. Local community group Preserve Rural Orange (PRO) has done a great job keeping public attention on UNC’s problems at the facility. 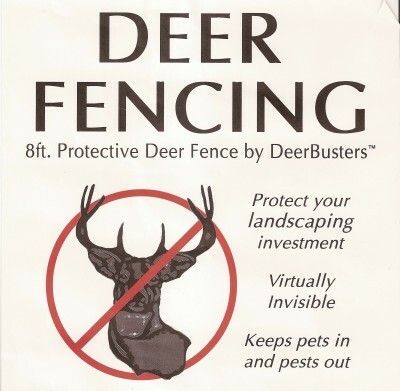 They have also provided a slew of good suggestions to address the growing concerns. Recently appointed Associate Vice Chancellor Bob Lowman, who has the unenviable task of straightening out years of shoddy operations, spoke on behalf of the facility this evening. He pointed out that 8 of 10 key issues PRO raised earlier this year have already been addressed, not because, as he said “they were working on them” but because “they did the right thing”. He related his new management approach – air problems quickly, address key concerns expeditiously and keep the community in the loop. After his presentation I felt that UNC was back on track by picking Bob to lead the effort. That said, I did ask the BOCC to consider jointly creating a framework with UNC for managing the growth of UNC’s Orange County facilities. This new framework would resemble the one Chapel Hill elective officials, staff and community members used to create the Carolina North development agreement. While I don’t believe all aspects of the Carolina North process apply to this new expansion, key lessons involving fiscal equity, transportation infrastructure, environmental monitoring and remediation and public participation could certainly be applied in addressing some of the issues arising from this project. For instance, one citizen mentioned that the White Cross Volunteer Fire Department was scrambling to get $900 to cover expenses dealing with protecting the existing Bingham Facility (which it appears doesn’t even have rudimentary safety gear like a sprinkler system). The $14.5M NIH grant recently awarded UNC for expanding the Bingham Facility will spur the creation of $60+million worth of facilities. $900 a year won’t cover it. Bob Lowman immediately offered to redress this financial inequity, which is fantastic, but depending on an ad hoc approach when we have four years experience in creating a structured, transparent and fairly thorough framework for highlighting and negotiating solutions to these type of problems makes little sense. Hopefully the BOCC will consider using those hard-earned lessons to manage UNC’s migration into rural Orange. Council seemed somewhat confused in making the decision to take the Rogers Rd./Millhouse community off the table as far as the new County transfer site. Details on the site selection criteria and an analysis of anticipated municipal fiscal impacts have been available since Spring here. The community-based, technical and exclusionary criteria were well established prior to Mayor Foy throwing the Town Operations Center site on the table. Both the Mayor and Council have been briefed on the criteria, so the confusion this evening didn’t quite make sense. Further, if the Council was concerned about the objectivity or quality of the criteria, as Councilmember Ed Harrison said he was, they had plenty of opportunities to improve upon the community’s approach. Neither individuals, like Ed, or the Council as a whole took that opportunity. I chalk up both that lack of participation and tonight’s confusion to institutionalized disengagement on solid waste management issues. Yes, technically the responsibility for managing Chapel Hill’s waste belongs to the County. No, that’s not an excuse for abrogating oversight and participation (if for no other reason than the link between Chapel Hill’s sustainable growth and responsible resource management). Tonight I tried to get the Council to take both Millhouse sites off the table. The Town’s by having staff apply the community-based criteria. And, subsequently, the County’s site by implication. Along with other concerned citizens we managed to move Council halfway towards that goal. [UPDATE] WCHL’s Elizabeth Friend’s report. Restricting the evaluation to “effects” and “impacts” on Chapel Hill’s own operations takes a rather narrow view of our community’s responsibility for dealing with our solid waste. Over two years ago, I and other concerned Chapel Hill and Orange County residents questioned the Solid Waste Advisory Board’s – SWAB – selection of the current landfill for use as a trash transfer site. The SWAB’s criteria for selecting that site seemed arbitrary and capricious – especially given the broken promises and many years of environmental and socioeconomic impacts on the Rogers Road/Millhouse community. I’m quite familiar with the issue having collaborated with citizens and groups – such as Preserve Rural Orange represented by Laura Streitfeld, Orange County Voice represented by Bonnie Hauser, Orange County Community Awareness represent by Nathan Robinson and our local Rogers-Eubanks Coalition represented by Rev. Campbell ñ to convince the Orange County Board of Commissioners to adopt community-based, objective and measurable criteria for siting the trash transfer facility. Adopting transparent criteria was critical to building community consensus with the final proposal. The Commissioners agreed and our County consultant, Olver, began to meet with folks from all over the County. Last year, the culmination of that effort lead to the creation of a set of community-based, technical and exclusionary criteria for determining an appropriate location for the transfer site. These criteria were well-publicized and in-place well before Mayor Foy recommended the Town Operations site. Further, these criteria had been presented to Council several times during Joint Governmental meetings. A cursory review of those criteria – even from a laypersons viewpoint – would have immediately led one to understand how inappropriate the Town’s Operation Center site suggested is – violating 6 or more key criteria. To continue to entertain this site not only flies in the face of the criteria our community developed in cooperation with Olver, the technical consultant, and the Orange County Commissioners but continues to undermine the community’s confidence in a transparent and fair approach in addressing this community’s responsibility for our waste. I ask the Council to instruct staff to not only review the impacts upon Chapel Hill but to also analyze the Millhouse sites in light of the community-based, technical and exclusionary criteria that our citizens help create. Once they do that, I believe the Rogers Road/Millhouse community sites will be off the table – once and for all – and that the Town can then turn back its attention to addressing the long standing obligations we have to our neighbors in that community.